Photos from our great trip to one of the most amazing places on Earth! Waiting in line to cross the border into Canada at Oroville. 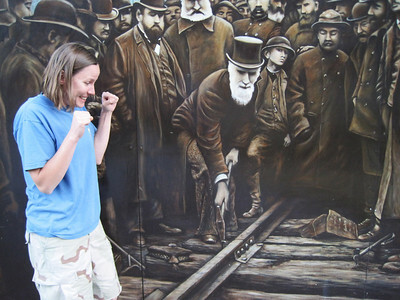 Dawn barely contains her enthusiasm at the pounding of the last spike in the Canadian Pacific Railroad's transcontinental route. 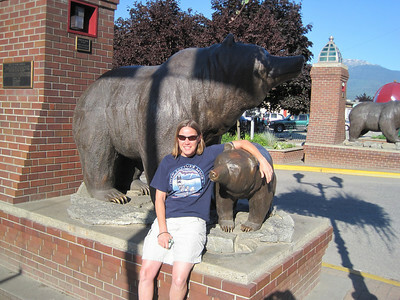 Dawn flirts with disaster, hanging out with a mother grizzly and her cub in Revelstoke, BC. 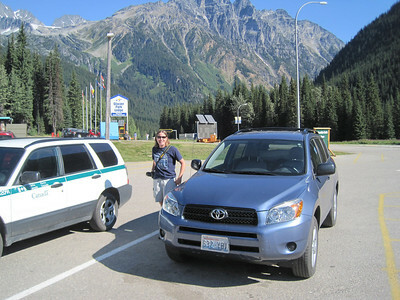 Dawn with Raven Four at Rogers Pass in Glacier National Park. 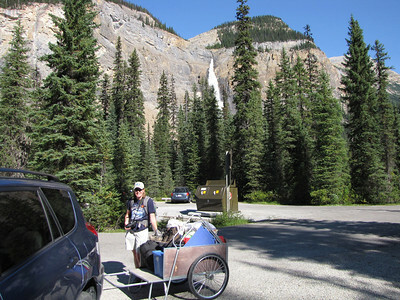 With one of the carts provided by Parks Canada to haul camp gear into the Takakkawa Falls Campground. 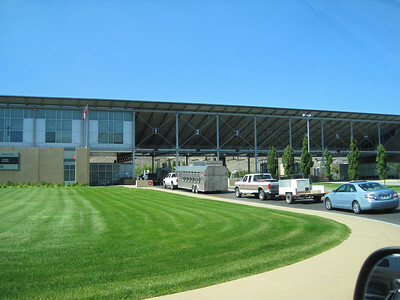 It's walk-in sites only, about 400 meters from the parking lot. 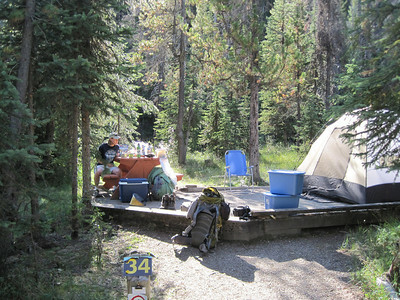 In camp at Takakkawa Falls Campground. 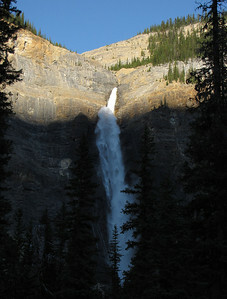 Dawn at the base of Takakkwa Falls in Yoho National Park. 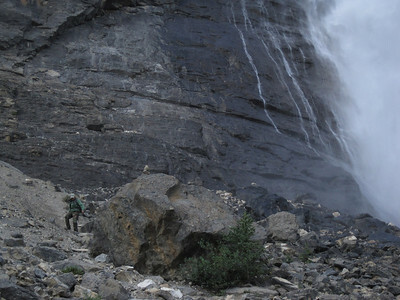 Hiking down from the falls. 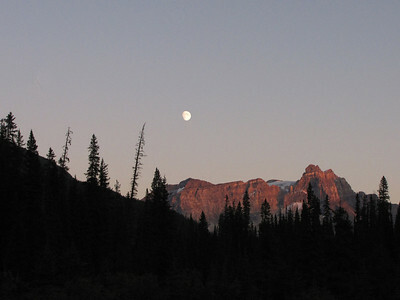 Moonrise over Cathedral Mountain in Yoho National Park. 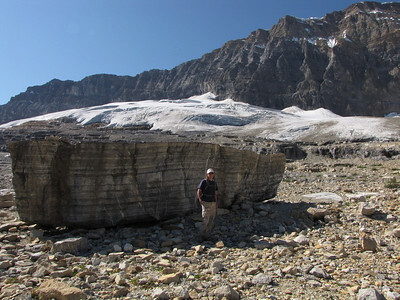 Dawn and huge boulder along the Iceline Trail in Yoho National Park. Note the layers of ancient ocean sediment. 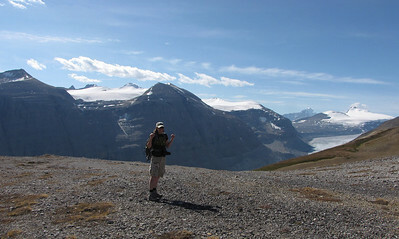 On the Iceline Trail with Daly Glacier, the source of Takakkaw Falls, in the background. 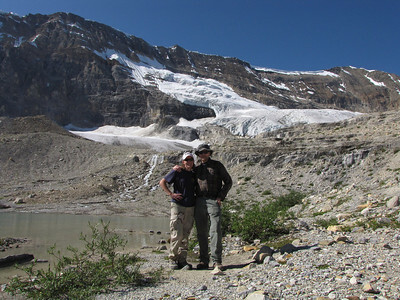 At one of the small glacial lakes along the Iceline Trail. 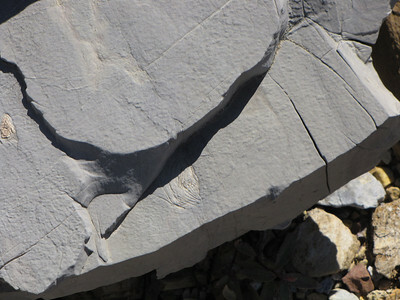 A Trilobite fossil in some mudstone along the Iceline Trail. 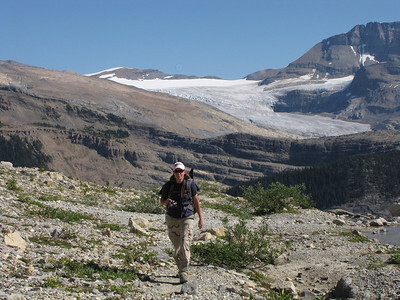 Estimated age of the fossil is around 510 million years old, based on fossils dated in the nearby Burgess Shale. 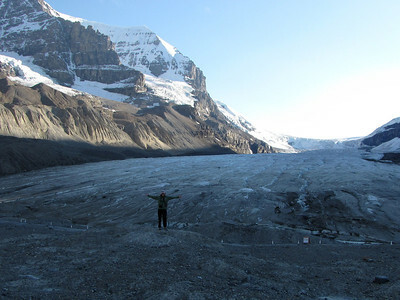 Dawn meets a glacier for the first time. 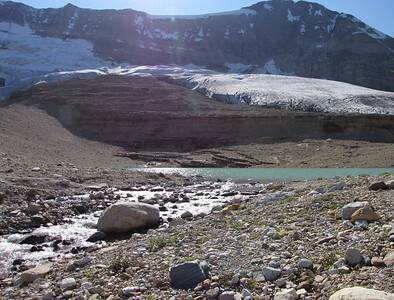 Under the silt and gravel was crystal-clear ice. 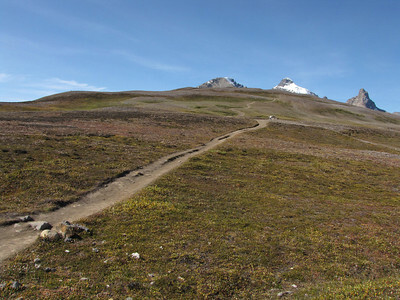 The Iceline Trail, looking south as it winds through the glacial moraines. Lake and stream along the Iceline Trail. 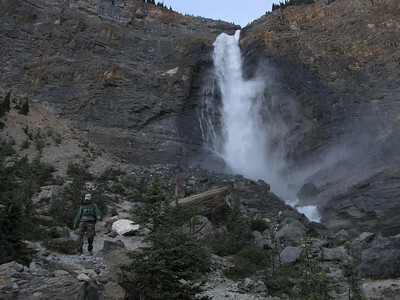 Takakkaw Falls from the Iceline Trail. 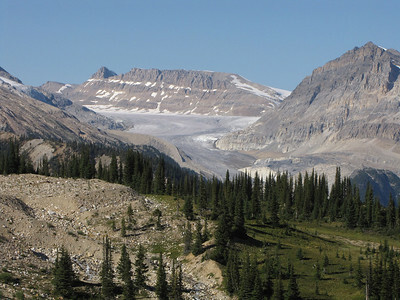 The Crowfoot Glacier, Banff NP. 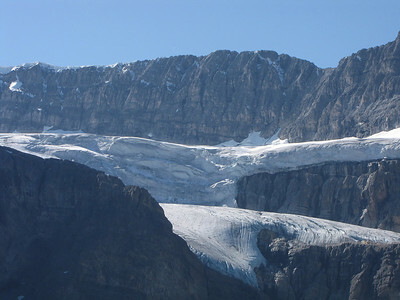 Bow Glacier in Banff National Park. 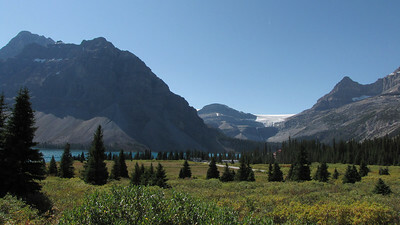 Bow Lake with Bow Glacier in the background. 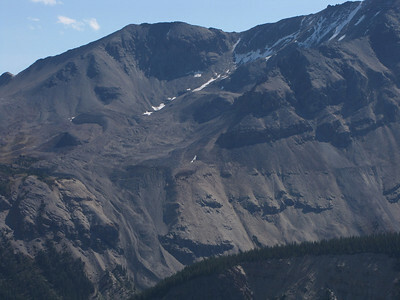 Photo taken from Highway 93, The Icefields Parkway. 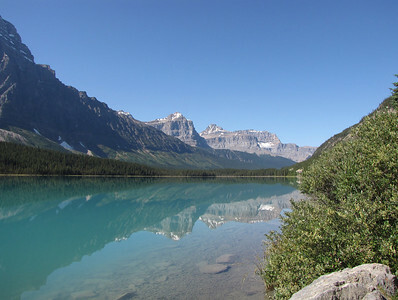 Waterfowl Lake along Highway 93. 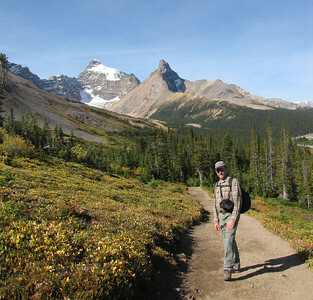 Saskatchewan Crossing in Banff NP. "Their isolation brings you in, their high prices push you out." 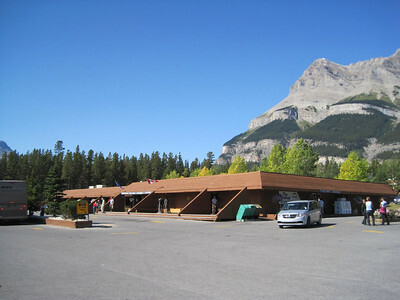 Due to being the only place between Banff and Jasper, the prices on everything were sky high. We didn't buy much. 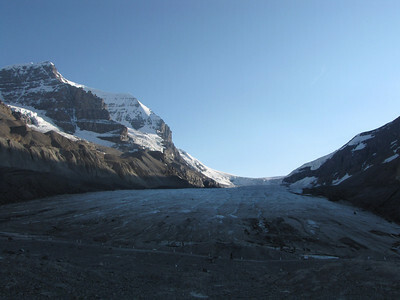 Athabasca Glacier with Mount Andromeda to the left and the Columbia Icefield in the background. 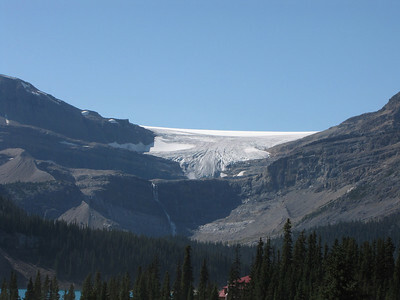 The glacier is the headwaters of the Athabasca River, which eventually drains into the Arctic Ocean. 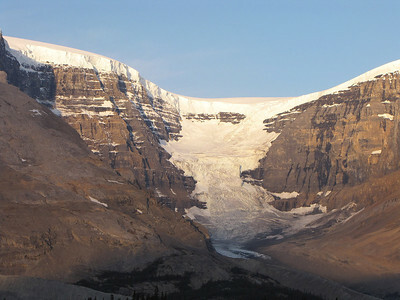 Dawn at Athabasca Glacier on a fine summer evening. 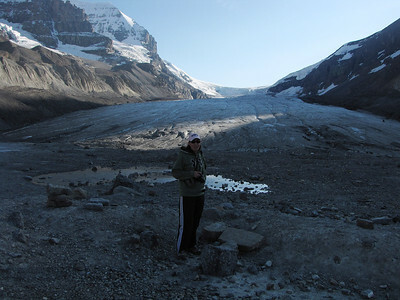 We'd hoped to hike up onto the ice, but it's not permitted anymore due to the condition of the ice at the toe of the glacier. 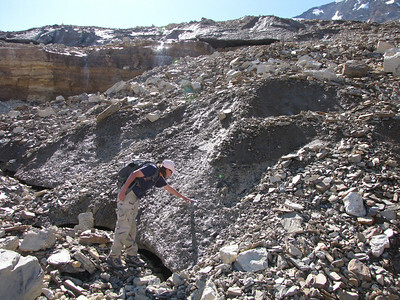 It's riddled with water channels on the surface and subsurface, as well as cavities and other hazards. 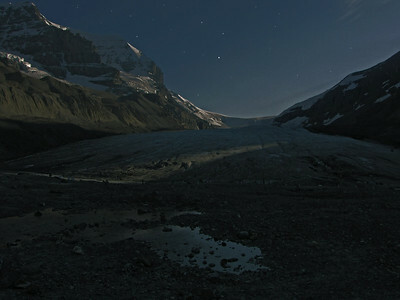 Athabasca Glacier as it might look by moonlight. Photo modified in Photoshop. 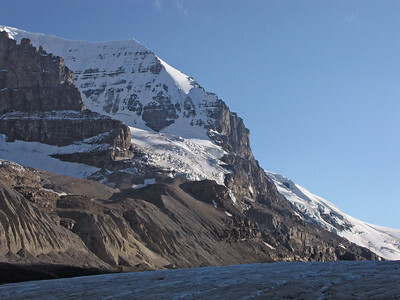 Glacier and mountains to the south of Athabasca Glacier. 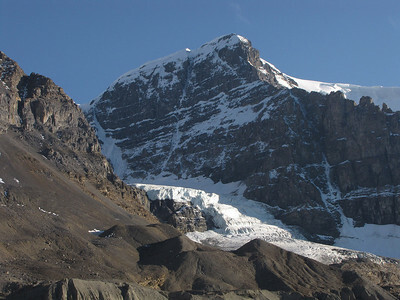 The glacier is big. Bigger than all of us. 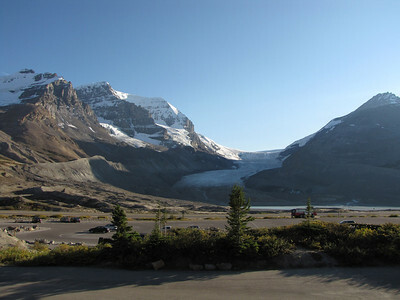 Athabasca Glacier from the parking lot of the Icefield Centre. 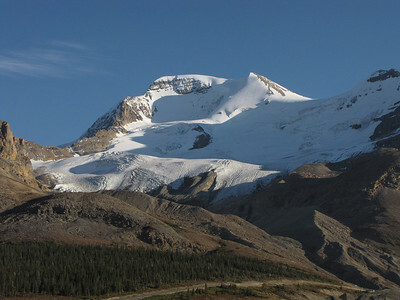 Mount Athabasca and it's cool glacier. 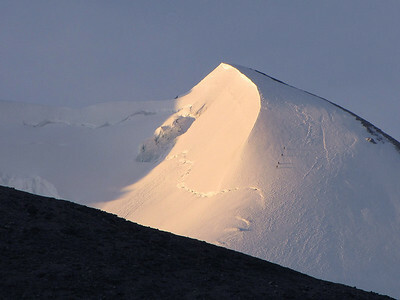 Climbers nearing the summit ridge of Mt. 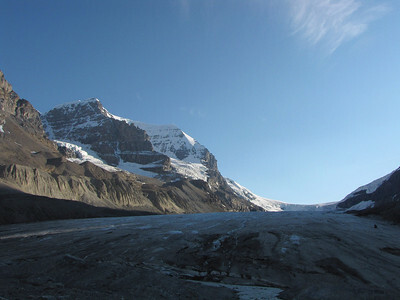 Athabasca just after sunrise. They might've been our neighbors in the campground the previous night since those guys got up at 2:30 and left soon after. 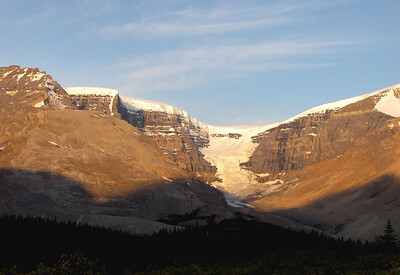 Dome Mountain, Dome Glacier and Mount Kitchener at sunrise. 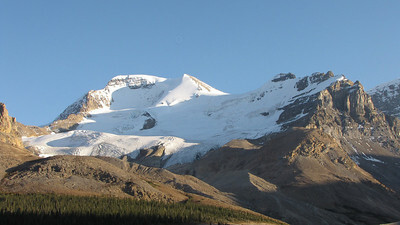 Dome Mountain and Columbia Icefield ice cliffs. 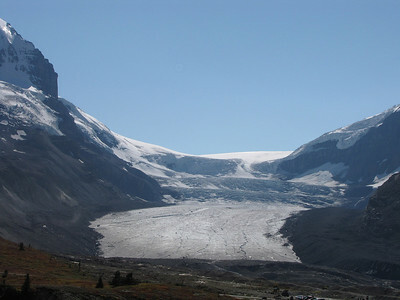 Dome Glacier and Columbia Icefield. 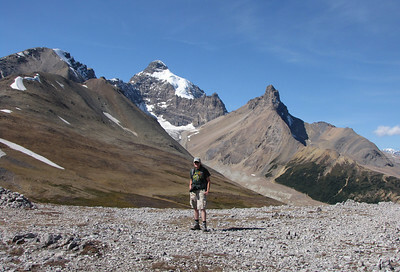 Me on the Parker Ridge Trail in Banff NP. Dawn is simply crackers about Parker Ridge! And so am I.
Fossils on Parker Ridge. 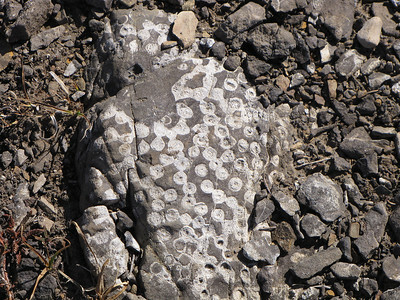 In this photo are corals, sponges and some shell fossils. 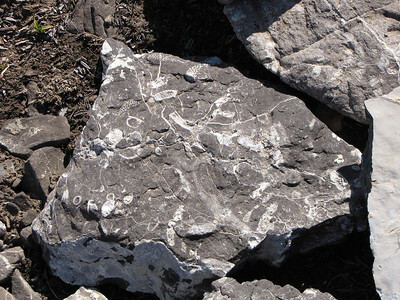 Fossils on Parker Ridge, featuring corals, sponges and some shelled creatures. 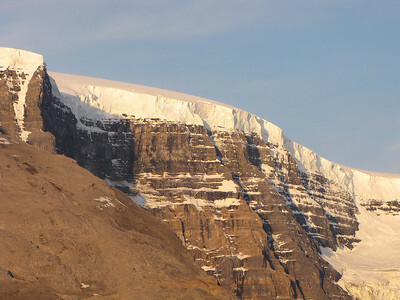 A rock glacier. 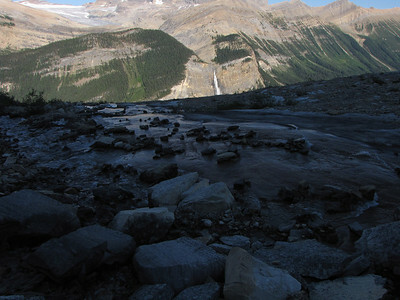 Rock glaciers are slowly-flowing talus formations composed of rock mixed in with ice. 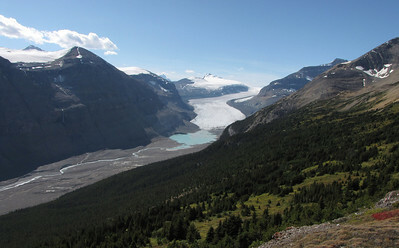 Saskatchewan Glacier and the Columbia Icefield from the Parker Ridge Trail. 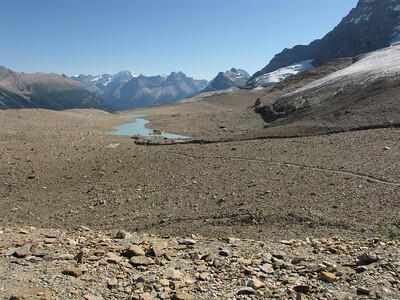 The waters from this arm of the Columbia Icefield drain into Hudson's Bay and eventually the Atlantic Ocean.